The editor of Beyond, the new magazine I wrote about yesterday, was once one of the two drummers of a new wave band called Next Crisis. His name is Erk Willemsen and his love for music is beyond passionate. For the past 15 years or so he has been making making music magazines, organising music festivals and doing all kind of other headache producing activities. If I could drum like him, I would have stayed a drummer! Of course, I would not play drums in a band like Next Crisis. New Wave scores very high on my list of music that I prefer not to listen to. In 1982 I met the girlfriend of Erk Willemsen on a train, Tineke van Brederode. Of course I had never heard of him or his band yet. She was trying to avoid the conductor, hoping not having to buy a ticket. Because she was carrying a huge map, I asked her what was in it. 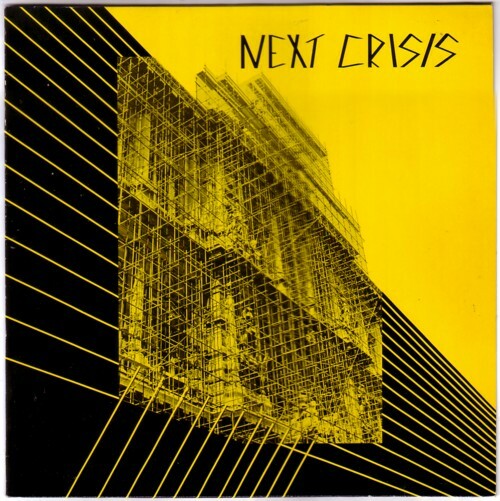 It was the artwork for the cover of the LP for Next Crisis, which she had promised to make, but which she couldn’t finish because of some technical difficulties. Since I am a graphic designer I offered to help her out, we exchanged addresses, and the rest is history. The LP didn’t sell a copy, the band ceased to exist the next year, and I haven’t listened to the LP for 24 years. But after I had written the story about Beyond, I took the LP from my shelves and played it. After that I placed the LP back on the shelves, where it will probably stay for another 24 years. I have seen the band live several times, and they were better than I would like to admit to my rock’n’roll friends. I remember one concert in particular. It was for an audience of about two hundred people. Half of the people were severy mentally handicapped, and the other half was medical personnel. Knowing the repertoire of Next Crisis and having huge prejudices about the musical taste of mentally handicapped people, I expected the worst. But it turned out to be a wonderful evening and a great concert. When I walked home that night I believed for a few hours that not all new wave music is as bad as I thought. Here is Next Crisis with No attention . The singer is Geertje Hoeffnagels, who will appear again later in this Soundtrack.